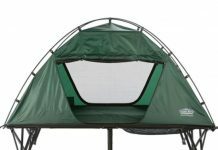 For a family that loves the outdoors and is planning a camping trip together, one of the foremost requirements is that of choosing family camping tents. You can’t just pick up the first one you see nor can you be sure that the one your neighbor has is right for you. 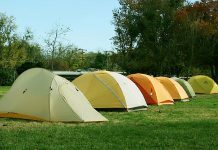 Each family needs to look for family camping tents that suit their particular needs. 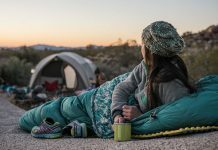 Here are a few tips to help you choose the right type of tents and also a few suggestions on tents that may work for you. The first and foremost thing is the size of the family camping tents that you are looking for. 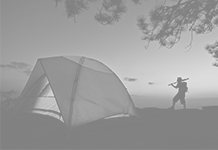 Camping tents are normally advertised as two man or four man or even six man tents. Ideally these tents are not sufficient for the numbers mentioned. Practically speaking a four man tent will be comfortable for two grown ups only, as you need space to keep your gear and also sleep comfortably and have enough room to be able to stand up and change clothes. Ideally there should be around 32sft of space per person. 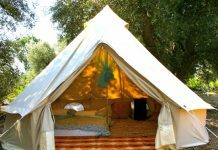 It would be comfortable and practical to have separate tents for children who are older than 7-8 years. 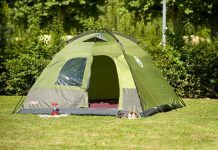 You can choose smaller family camping tents, but with teenagers remember to choose a tent just as you would for an adult. 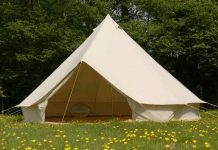 Once you are decided on the size you may want to choose from an Umbrella, dome, geodesic, A-Frame or wall shaped tent. You can choose a shape you are comfortable with. Wall tents tend to have more space thanks to their straight tents and the umbrella has the most standing space. Square floor tents are space efficient but need larger areas to pitch where as round floors need les space but are also inefficient with space management. You can choose from fiber glass or aluminum poles. Poles may snap so remember to carry your emergency repair links just in case when out on a family camping vacation. Most tents are made from nylon. 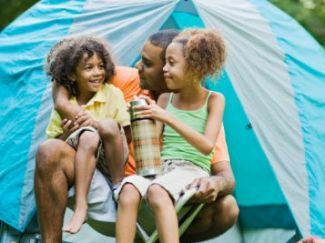 Look for a thicker fabric that is also no rip, so that the family camping tents last longer. Some things to check when doing the actual shopping are zippers and the seam. Check the zippers for free movement and also that the seams are reinforced with plenty of nylon tape to keep away rips. 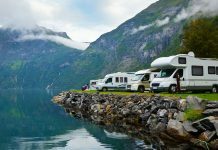 You may also want to consider the weather during which you are likely to take a family camping vacation. If you are expecting rain you may need roomier family camping tents that not only keep the water at bay but are also big enough to spend a few hours comfortably in. In case you are looking at cold weather you will need special tents to keep you warm. Last but not the least your budget makes all the difference. 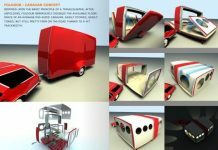 The high end family camping tents will no doubt be more durable and last longer. 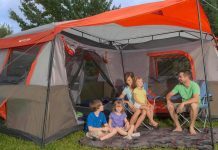 Some popular choices for family camping tents are REIHobitat Family Tent( ideal for families with small kids), Pine Crest Turbo Tent for Families ( great for bigger families with divider to give more privacy when needed), Coleman Weathermaster Elite 6-Person Family Tent ( a three room tent), Sierra Designs Moken 6 Family Tent( three room and very light). 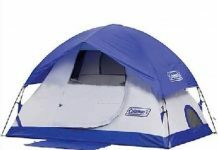 Choose your family camping tents with care and enjoy your family camping trips in comfort.